Often the difference between a long and happy life and a short and difficult one is health care. 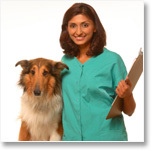 With proper medical attention most pets are extremely healthy and sturdy beings. Without it, they will suffer. If your pet hasn't been immunized before he joins your family, he will need shots to protect him from a variety of dangers. The first rabies shot is given at three to five months, and is good for one year. After the first year, the rabies shot can be given once every three years. Typically, state laws require only rabies immunizations. Most cities require proof of rabies immunization as a condition of granting a dog license. Clearly, a rabies immunization is important, but don’t stop there. Get all the shots recommended, most of these other diseases are potentially fatal and set up a schedule for return visits and booster shots. Keep track of the immunizations your pet receives (including those received before you got him) and make sure you follow up with boosters at the recommended times throughout your pet's life. HEARTWORM, which is transmitted by mosquito bites and resides in a pet's heart or nearby major blood vessels. An infected animal lacks energy and may have a chronic cough. Prevention is much easier than a cure, so ask us if your pet should be medicated against heartworm during the mosquito season. HOOKWORM, which can be transmitted from the mother to the baby during nursing. This parasite fastens itself to the walls of the small intestine, and drains the pet's energy by causing anemia and loss of appetite. A black tarry stool, often with traces of blood, is another symptom. ROUNDWORM, which also can be transmitted from mother to baby before birth or during nursing. Infected babies usually develop potbellies; the larvae spread through the body, causing dehydration, diarrhea, pneumonia, stunted growth and vomiting. TAPEWORM, which is contracted when a pet swallows larva-laden fleas. Symptoms include rice like deposits that turn up in the pet’s feces. WHIPWORM, which causes diarrhea, chronic bowel inflammation, mucus in the stool, and ultimately weight loss. The most common external parasites are wingless bloodsucking insects, and the most common of these is the flea. Symptoms are continual scratching and loss of fur. Over time, fleas have become resistant to many flea-control products, so ask us to recommend an effective flea-control plan. Be sure you read and follow the label directions carefully. A once-a-month pill, available by prescription, prevents flea eggs in your pet’s fur from maturing. Unfortunately, it won’t eliminate grown fleas, and it requires 30 to 60 days to become effective. But it will kill eggs, which are a source of future infestations. Long-lasting, topically applied products can also be effective, and are available over the counter.